‘By union the smallest states thrive. By discord the greatest are destroyed’ – This is what has been proved by the local volunteers of Versova, when they cleaned up trash from the Versova beach in Mumbai. 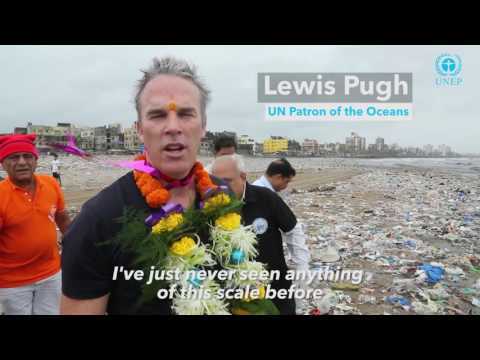 United Nations Patron of the Ocean, Lewis Pugh joined Afroz Shah, a 33 year old lawyer and other Versova residents in this world’s largest beach cleanup program. The volunteers have claimed that they have so far collected 2.38 lakh kilos of garbage from a 2.5 km stretch on Versova beach. The people of Versova have shown us that no challenge is insurmountable, Lewis Pugh tweeted. Afroz Shah and Late Harbansh Mathur took the initiative in October, 2015 to clean the dirty beaches themselves. Later, people started joining them for the clean-up activity, which has now become the world’s largest beach cleanup program. Watch the video below to know how the volunteers have made it possible.